Samantha Garvey and her family had been living in a shelter for several days when they got word the 17-year-old aspiring marine biologist had made it to the semifinals of the prestigious national Intel science competition. Now, with donations coming in and the county finding them rent-subsidized housing, she'll again be able to do her homework in a home. "This is just the most amazing thing you could ask for," the diminutive Garvey said at a news conference Friday, surrounded by her parents, brother, sister and a cadre of politicians and school officials. "We're all in tears here," she said after Suffolk County Executive Steve Bellone announced that the Department of Social Services had located a nearby three-bedroom house where the family could live. "This is what we've always wanted." Garvey is one of 300 teenagers nationwide named this week as semifinalists in the prestigious Intel science competition; finalists will be announced at the end of January. She spent more than two years researching the effects of the Asian short crab on the mussel population in a salt marsh on Long Island, east of New York City. "What Sam found was that, like after anyone, after being attacked you develop a tough skin of shell," said her science research teacher, Rebecca Grella. "These mussels were able to increase their thickness and protect themselves against their predator." Grella noted the link between Garvey's challenges and those of the mollusks she studied. "I do believe that is an amazing metaphor," Grella said, "and I do see Sam as a strong mussel." The Brentwood High School senior, who has applied to Yale and Brown universities, was evicted along with her family from their home on New Year's Eve. Her mother, Olga, a nurse's assistant, was out of work for eight months following a car accident in February, and her father, Leo, could not keep up with the bills alone on his salary as a cab driver. Intel Semifinalist Samantha Garvey, 17, right, gets a hug from her science research teacher, Rebecca Grella, left, after an announcement by Suffolk County officials, at Brentwood High School in Brentwood, NY. Garvey and her family were offered a rent subsidized home by officials in the Long Island county where she goes to school. Samantha Garvey is one of 61 students who have a chance at the competition's top prize of $100,000. 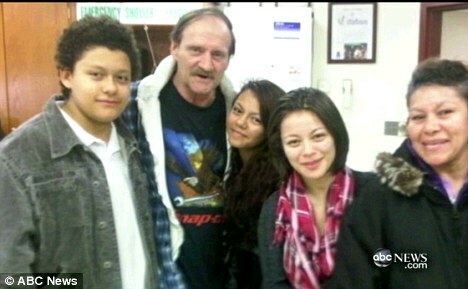 The 17-year-old and her family moved into a homeless shelter on Jan. 1. Suffolk County officials made the housing announcement at Brentwood High School, where Garvey is a senior. County official Steve Bellone says Garvey and her family can move into the house in about 10 days. Housing prices on Long Island are among the highest in the country, even in Brentwood, which has struggled with gang violence in recent years. A three-bedroom home there recently sold for $291,000, according to Lisa Kennedy, a broker with Eric G. Ramsay Associates. A three-bedroom ranch is renting for $1,800 a month, she said. The Garveys will pay 30 percent of their monthly income to rent the county-owned property, officials said. Gregory Blass, the county commissioner of Social Services, said the family was already known to officials because they were staying in a shelter, making them eligible to move into the house. He said the county works to place about 30 to 40 homeless families a month from shelters into apartments or homes. He insisted the Garveys received no preferential treatment because of Samantha's celebrity. The house is undergoing renovations and should be ready for the Garveys in about 10 days, Bellone said. Leo Garvey, Samantha's father, said that after the eviction he took his family to a hotel for a week because he did not want them spending New Year's in a homeless shelter. But he finally had to contact Suffolk County Social Services for help last week; they were then placed in a shelter. This week came the accolades for Samantha's scientific feat and the offer for the family to live in a home of their own. Her story has gotten coverage nationwide. Once sponsored by Westinghouse, the Society for Science and the Public has been running the competition since 1942. Over the decades, contest finalists have gone on to some of the greatest achievements in science. Seven have won a Nobel Prize. Before the eviction, the Garveys had rented a home for six or seven years, Leo Garvey said. Before that, the family had also lived in homeless shelters from time to time; Leo Garvey described himself as a recovering alcoholic. Samantha said that she had worried for several months before the eviction, knowing that her mother was ailing and money was tight. "I ordered a senior picture and I said, 'I don't know where to send it. I don't know what's going to happen. What if we move, what if we get evicted,' which we did," she said. "You're out in limbo. You're like, 'What's going to happen to my mail, what's going to happen to my college applications. Where are they all going to go?' It's scary." Besides the county housing, officials said the Marriott Corp. is donating "several thousand dollars" of furniture for the family to use. Others have offered to pay kennel fees for the family pit bull. "It's unbelievable; the outpouring of help that we've had," said Leo Garvey. He made reference to a news conference also held Friday in Suffolk County announcing the latest winner of a Mega Millions lottery jackpot, saying: "I feel richer than that $208 million winner." Suffolk County Executive Steve Bellone, left, applauds as Intel Semifinalist Samantha Garvey, 17, right, speaks to the media, at Brentwood High School in Brentwood, NY. 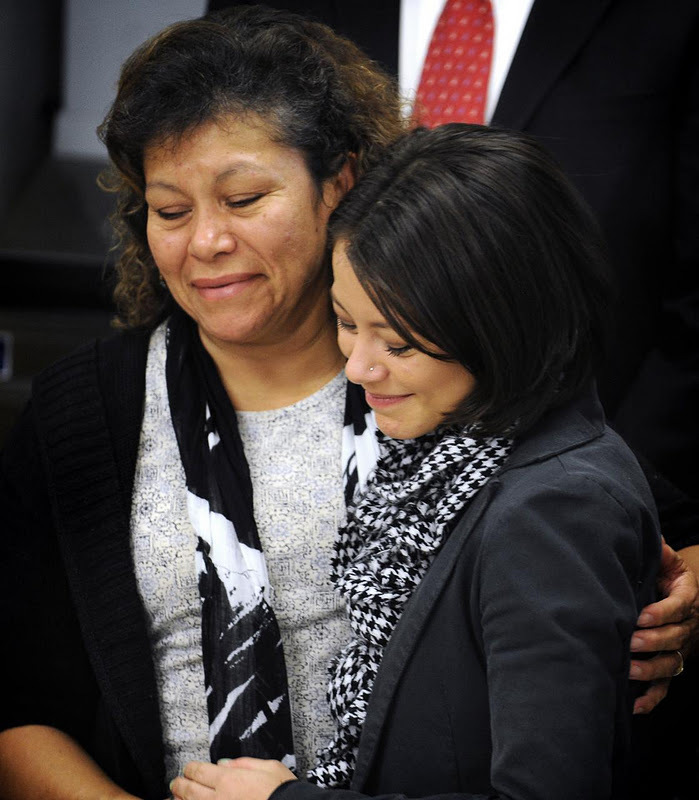 Olga Garvey, left, hugs her daughter, Intel Semifinalist Samantha Garvey, 17, right, during an announcement by Suffolk County officials, at Brentwood High School in Brentwood, NY. Samantha Garvey, an Intel semifinalist whose family is homeless, and her father Leo Garvey. 14 responses to "Extraordinary story of the homeless teenage girl who is so gifted she could transform her family's life with $100,000 science prize"
I have a hunch that there are many young people like Samantha amongst the growing homeless population. Luckily, Samanthas and her families plight become visible after her nomination. I am thinking how many other families are in the same situation, a situation which does not have to be. What if each city passed a law, which would state that any foreclosed house, owned by a bank and standing in disrepair for extended period of time will be taken by eminent domain by the city. What if than these homes were rented back to these families for what they could afford and with the stipulation that they would repair the homes and keep the properties clean. What if the rental monies were put back to serve the city by repairing roads, buildings, etc. and for education and health care. This is how jobs could be created, by recycling the profits from stolen homes back into communities rather than some fat private investors pockets. Good Photos, thanks for this. Amazing, this is a real American Idol. This is wonderful. Congratulations, Sam! This a great story for this young lady. thats fantastic news but why couldnt they move to atown to live thats cheaper? Dont know but this story sounds fishy to me. This is a good lesson to see how far karma is lying in our hands. Keep the job little girl, you are changing the world. Quite a heart-warming story. It seems she deeserves the very best. We need to have more stories aboutsuch inspiring people. Samantha, may you come out top and win many prizes. succeed. It shows that if you want to make it in this world, you can overcome bad circumstances. congratulations Samantha. All The Best and Good Luck.